Plot synopsis: A former police commissioner in the French Sûreté returns to investigate a series of high-profile robberies. Review: Most Suspense crime stories are based in either America or Britain, so this episode at least offers something a little different in terms of its French setting and characters. However, beyond this, there's not much positive to say about it. The biggest problem is that the main character is insufferably arrogant, so it's hard to care about the fact that he may have been unfairly forced out of his job in the police force, or about his efforts to prove himself again as a detective. Nor is the plot all that interesting, as we don't learn much about the robberies he investigates. There is a twist at the end, which is reasonable enough, but not really sufficient to raise the episode above the mediocre. Plot synopsis: The husband of a couple that performs a nightclub mind-reading act is astonished when his wife appears to begin reading minds for real. Plot synopsis: A young man believed to have been murdered three years previously, but whose body was never found, seemingly reappears - but is it really him, or an impostor? Based on a novel of the same name by Carl Randau and Leane Zugsmith, first published in 1944. Plot synopsis: With the world on the brink of catastrophic war, a scientist is persuaded by the ghostly voice of a fallen comrade from his old army unit to place a recorded message aboard a satellite about to be launched into orbit, which when transmitted around the globe will hopefully avert the impending conflict. Review: In 1958, when this episode was broadcast and the threat of World War III perhaps seemed very real, the story it presents may have been relatively compelling. Yet listening to the episode decades later, it's hard to feel the same. The story is an anti-war one, but with a rather odd quasi-religious/supernatural dimension, as the protagonist is plagued by the voice of a dead comrade from his days in the army. This is silly enough, but the fundamental problem with the episode is that the idea it puts forward for averting global war - a message of peace beamed around the world - is just too laughably simplistic to be taken seriously. Indeed, it is almost adolescent in its naivety. When one considers that the Cold War produced thoughtful and sophisticated anti-war satires like Dr. Strangelove, this episode seems woefully poor by comparison. The story also suffers from being preceded by a very peculiar, and quite pompous, introduction in which the announcer (William N. Robson) declares with great solemnity that Suspense is 'unequivocally … against murder'. Okay, but what made the programme's makers think that anyone ever imagined otherwise? Plot synopsis: A woman travelling on a cruise ship discovers that there is a stowaway aboard who may be the notorious 'Blackout Killer'. Review: One of the great strengths of many early Suspense episodes is that listening to them can feel almost like watching a classic Hollywood movie. 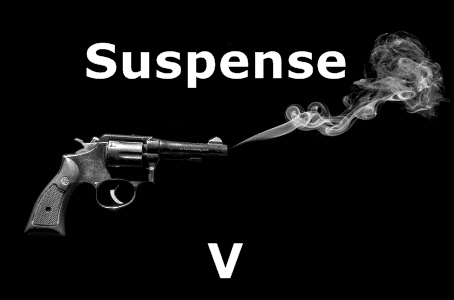 The style of acting, music and incidental effects employed during this era of Suspense all help to create such an impression, and I very much felt that with this story, at least at the start. Unfortunately, the quality of the plotting does not always match that of the production, and in this case, matters are fairly disappointing. It's a standard issue hunt-for-a-serial-killer story - despite the slightly unusual setting of a cruise ship - with a twist at the end concerning the identity of the heroine's companion which is eminently predictable. Another issue with the episode is that we never encounter the killer actually at work, meaning that there is little in the way of real tension. However, the biggest problem is the fact that the male protagonist, played by Reginald Gardner, is massively patronizing towards Olivia de Havilland's character - talking down to her with lines such as the one I quote above - which undermines any interest the audience might have in their relationship. Still, both Gardner and de Havilland are fine actors, so there is some value to be found in the episode in terms of their performances.